I recently did a review of the KEEN Men's Targhee II Mid Waterproof Hiking Boots and while I was compiling a top ten hiking boots for women gallery, it was pretty clear to me that the women's version of the Targhee II hiking boots would make it to that top ten list. That got me to thinking I should do a review of the ladies version of these popular boots. A very popular choice with many, the Keen Targhee II Mid Waterproof hiking boots won't break the bank. Good for day hiking and casual use. As with the men's version of the Targhee II, they are a top seller on Amazon. I would put them in the mid range for a pair of entry level hiking boots. They are priced in and around $135 so while not cheap, should be within reach of many. Overall, they sport a technical look but there is also a hint of the traditional from them too. As with the men's version, The upper is made from waterproof nubuck leather and the outsole boasts aggressive lugs to ensure grip on the trail. The KEEN logo appears on the side, rear and sole of the boots but isn't too aggressive in my opinion. All in all the boots look sturdy. There are five color combinations to choose from in the ladies version of the Keen Targhee II boots 1. Neutral Gray/Mineral Blue 2. Gargoyle/Caribbean Sea 3. Slate Black/Flint Stone 4. Raven/Bossa Nova 5. Black Olive/Slate Rose. The overall look of the boots is pleasing to the eye and gives off a good first impression. The Targhee boots list many of the features I'd expect in a decent pair of mid hiking boots. If you're new to buying hiking boots, check out my hiking boot buying guide to list out some of the main things you need to consider to help ensure you get a good pair of boots to meet your needs. I am somewhat afraid I will be repeating large parts of the men's review in this review as the features, for all intents and purposes, are all broadly similar. There are however some unique nuance with the female version e.g. in terms of sizing and so on. Plus, if you're reading this, you're most likely a lady and so would, logically, most likely not have bothered reading the men's review 🙂 So, with that in mind, let's crack on and take a closer look. When taking a closer look at hiking boots, I always like to start with comfort. It's a key part of the overall success or failure of a hiking boot. Starting internally, the Targhee II Mid Hiking Boots feature a Removable metatomical dual density EVA footbed (aka insole). This does sound very technical so I want to try and break this down to give you a better idea of what it actually means. A metatomical insole is an insole that is engineered to provide really good arch support and it is designed to cradle the natural contours of your feet. The acronym EVA stands for Ethylene-vinyl acetate (EVA), sometimes also referred to as poly(ethylene-vinyl acetate) (PEVA). In layman's terms, EVA is a dense foam which can be easily manipulated and shaped. It also has the capability to act as an excellent and durable shock absorber and so, it is regularly used in the construction of boots and shoes. It was first introduced in the athletics world but it is much more widely used in all sorts of boots and shoes these days. So, we're of course all about hiking here so how does the above translate in terms of comfort on the trail? Well, the main point of note is that this is where the bottom of your foot meets the insole of the boot. Therefore, you need to have something in there that can take a bit of abuse from the varying types of terrain you encounter on the trail, protecting your feet in the process. As already alluded too, the make-up of EVA means it performs this job very well. It's worth noting that EVA is a commonplace industry standard, so you are guaranteed a certain level of performance in terms of structure and support. The other word of note referenced in the very technical term above, is 'removable'. This is self-explanatory but just to elaborate, for those who may not be familiar, it just means you can remove the insole from the boots. This is a handy option to have to enable you to air the insoles and inside of the boots after a tough day on the trail. As you can see in the image below, the collar of the Targhee II boots for women are thick and padded. Ankle support is provided via a torsion stability ESS shank. We'll look into that in more detail in another section below. The tongue of the boots is also padded, also visible in the image below. Nothing unusual with that, padding provides cushioning around the foot and ankle and is common in mid style boots. Padding on boots of this style and design also need to work in conjunction with the lacing system which we'll look at next. As you can also see in the image above, the laces tie criss-crossed to the top of the shank of the boots. This is again all normal but this is also where I notice my first slight concern with the Targhee II, the lace eyelets. As you can see, they're made of fabric. I am always somewhat cautious of fabric lace eyelets in hiking boots as should one of them go, your hiking boots are more or less ready for the bin. The photo below takes a closer look at the eyelets to help show you what I mean. Fabric eyelets, in my humble opinion, aren't the strongest way to provide a lacing system in hiking boots. Now, there is of course a plus side to them too. In terms of weight, they obviously add minimal overall weight to the boots so the fabric eyelets lend themselves to a lightweight boot which has it's own advantages. When I investigated this across user reviews, this item, the lace eyelets ripping, did come up a few times for some folks. It's not a total red flag but something to be mindful of when when buying hiking boots. How much rough and tumble do your hiking boots need to handle? Always keep that in mind before you purchase as a general rule. I want to give a quick mention about the laces themselves too as I noted a few people, in the many reviews I read, saying that the laces can come undone quite easily. I find this a common enough problem with mid boots in this style. 9 times out 10, an extra knot will do the trick. Where that doesn't work, you may need to purchase new laces, one's that can get a good hold and secure better. Buying new laces is unlikely to be needed in most cases though. The Targhee II boots are waterproof and breathable via the KEEN.DRY ™ waterproof breathable membrane. How waterproof a pair of boots really is, is hard to judge until you take them out on a test run against your personal expectations. I found a mixed bag when it comes to these boots being waterproof. A lot of folks were happy saying the boots were very waterproof but, of course, there were also quite a few who said that they weren't waterproof at all. This was exactly the same in the men's version too. The majority of user reviews, as with the men's, were in the former, they are waterproof, camp though. Personally, I find it very hard to say what is or isn't waterproof without knowing what someones expectations are. You won't be able to stand submerged in water in the Targhee II for too long, they will eventually get wet. However, will you need to be standing submerged in water for a long period of time? Most likely not, if you do, you will need a much tougher boot anyway. Most day hikers on established trails need protection from rain showers, puddles and that type of thing, so in terms of those types of conditions, you can expect the Targhee to perform well. Of course the more demands you make of them, into shallow streams and so on, the more likely water will get in. In terms of breathability, the women's Keen Targhee II Hiking Boots perform pretty good by most side by side comparisons with competitors that I found. The design of the Targhee II, typical of most mid style boots, really lends itself to being more breathable, so you can wear them at hotter times of year with no major concerns. The listed weight is 14.69 oz/417.2 g. so certainly on the lighter side for hiking boots. Again, this is what I would expect for a pair of mid style hiking boots and the lightweight make-up means they work very well for light day hiking but probably not ideal for heavier trekking backpacking, etc. The next thing to look at is sizing. The Targhee II Mid hiking boots come in the standard size options. I didn't seem to see any specific options for narrow or wide feet. 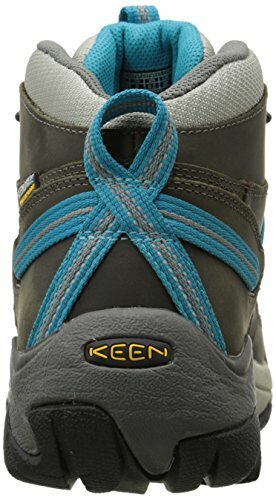 Looking at the Keen website, they advise, with regards to sizing, to order a half a size larger than your usual size as they run 0.5 of a size smaller than usual sizes. I saw this repeated across multiple user reviews and it is the same with the men's version of the Targhee II. I did see one or two reviews suggesting that 0.5 bigger wasn't enough and maybe a whole extra size may be the best option. However, they were the exception not the rule, which was to go with 0.5 size bigger. So, if you’re normally a size 8, go 8.5 or, on the outer reaches, a 9. With regards to break-in, the Targhee do very well with nearly all users indicating that no break-in period is required. Again, I would expect that to be the case with this mid style of boots. There's no tough leather to mold to your feet too so they should be ready to rock out of the box! At the rear of the boots, pictured above, and on the tongue are boot pulls. Handy when you have to pull your boots on up over your feet with thick hiking socks on. They should also enable you to adjust the boot as a whole and easily move them about on your foot until you find a comfortable fit before lacing them up. Not a major thing of note but still nice to have for sure. Support from the Keen Targhee Mid II Hiking boots for women is provided via a Dual Density Compression molded EVA midsole. We have already delved into the make-up and capability of EVA above. Moving on from there, we'll have a quick look at the midsole which is the piece that sits between the outsole and the insole. It serves the same purpose as we reviewed above i.e. it takes shock from the ground and helps distribute it evenly across your foot. The Dual Density bit means that the midsole is made up from material with two different densities making it stronger. Dual density construction is usually incorporated in shoes and boots to help prevent over-pronation (the way your foot roles inward when you walk or run). The shank of the boots support your ankles via a torsion stability ESS shank. Many reviewers commented that they were very happy with this aspect of the Targhee II boots and felt that when they were fully laced up, they gave very good ankle support. The Targhee II feature a patented toe box which protects your toes from any impact from the side or top. By all accounts, this works well and does offer good protection in that regard. The Targhee II features a Non-marking rubber outsole. The outsole features multi directional 4mm lugs, as pictured below, and are described as 'aggressive' to help grip terrain to provide good traction on the trail. Now, this was one area where I did come across a lot of not so great experiences from users. A lot of folks had issues with grip from the outsole with some commenting that it was practically non existent on wet stones. The other area I came across a few times from users, was that the lugs on the sole of the boots started coming off after relatively minimal use. I found this video review which although specifically about the men's version of the Targhee II boots, is still applicable as the design is so similar. It seemed to illustrate this potential problem that some people experienced. It's worth noting that this issue seemed to happen for some but of course not for all. If it was a fundamental design flaw, I can only think that everyone would experience the same issue but that doesn't seem to be the case. However, I feel like I should point it out to you to enable you to come to your own conclusion as I did come across it in my research. As I mentioned in the Men's Targhee II review, the positive I took from the gentleman's video linked above was that, he was very complimentary of the KEEN customer service. They seemed to be willing and able to deal with the problem swiftly and offer alternatives or a replacement. The Targhee boots come with a 1 year warranty from date of purchase. When reading multiple reviews, it seems that KEEN offer pretty good customer service. If you have any issues with their products, it seems they have a pretty good track record of sorting your issue out or providing alternatives.. The retail price comes in at the mid level range for a pair of hiking boots, but if you shop around, you can probably find a deal. Click on the image at the start of this review or any of the product links in this article and you will be taken through to Amazon where you can check the live price..
Based on all the reviews I have read, the construction, the brand, etc. 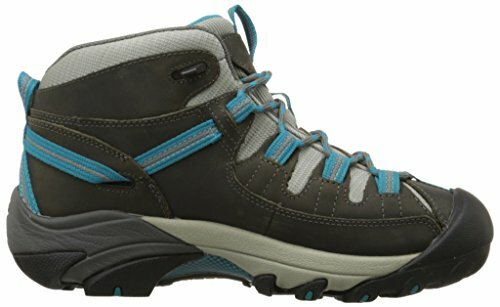 I think that overall, the KEEN Targhee Hiking Boots are reasonably good boots for the price you have to pay. They're a mid range light hiking boot and so the price is in line with similar brand name boots of that style, say running from $60 at the low end up to $200 at the higher end. I don't honestly feel that you're buying a pair of hiking boots that will last for many, many years of hard hiking, that's not what these are designed to be used for. If you are new to hiking or enjoy light hiking on well worn trails, I think the women's KEEN Targhee II Mid Hiking boots are a fair option to consider. If however, you’re a more adventurous hiker and like going off trail a lot and into tougher terrain, or if you're big into backpacking, I think you need to look elsewhere as you will need tougher hiking boots that will give you more versatility in a much broader sphere of terrain, conditions, etc. I'm leaving this section pretty much verbatim to the men's review as the best uses are the same. I think the Women's Targhee II Mid Hiking Boots are best used for light hiking / day hiking on well established trails. As alluded to above, I don't think they’re a great option for harder off trail hiking or backpacking. They’re a lightweight mid hiking boot and so I would keep their use light. They will also be super for general outdoor use, so say fishing, camping and so on. Or, if you like to do a bit in the garden, they'll work well for that kind of activity too. It's worth mentioning that they work well as a pair of day-to-day boots too, so they will look great with a pair of jeans or cords. 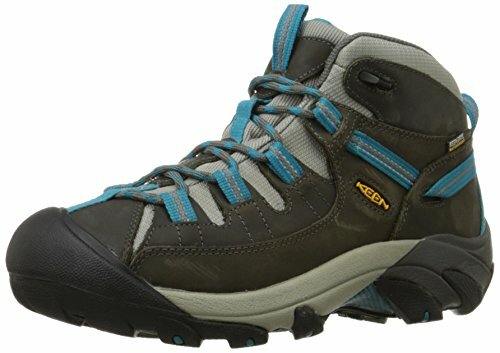 If you’re new to hiking and just testing the waters to see if it's something you want to get into, I'd seriously consider the KEEN Targhee II Mid Hiking Boots as an entry level pair of hiking boots. As of the date of this post, from about 1160+ reviews, across multiple retailers, 92% gave the Targhee boots 3 stars (out of 5) or more, 83% 4 stars or more and 66% gave 5 stars so they're scoring good for a lot of people. Not ideal for longer hiking treks e.g. backpacking, etc. 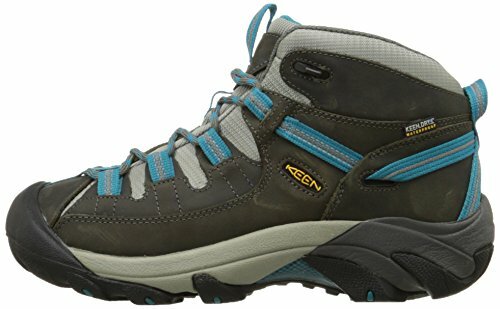 In conclusion, the KEEN Women's Targhee II Mid Waterproof Hiking Boots are a decent pair of entry level hiking boots for folks new to the trail. They also offer a pretty good lightweight hiking boot option for experienced hikers too. Overall, there is pretty good value in the Targhee II as long as your expectations are in line with what they're capable of. I don't really consider them a long term pair of hiking boots. I think with reasonable regular use, and assuming they're not over taxed beyond their capabilities, you should get two to three years comfortable use out of them. Overall, they are a popular pair of hiking boots and there are many happy customers using the KEEN Targhee II hiking boots. If you're still unsure what type of hiking boots you should get, check out the hiking boot buying guide and my hiking boot recommendations. I hope you found this review useful. Please comment and / or share it around your networks if you did. Do you use the Keen Targhee II boots? What was your experience with them?